We like to go on weekend trips with our toddler on low-cost airlines. 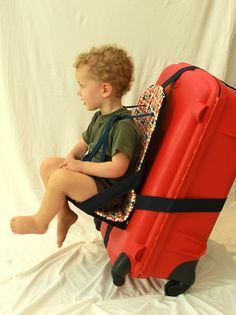 We often hike at the destination, and generally prefer child carriers and baby backpacks (like those listed here, i.e., a backpack that you wear that your child can sit in/on) to strollers, so we bring one of these as well as a car seat. Frontier Airlines has always allowed us to gate-check both without charge. They often do give us a somewhat confused look when we explain that the carrier is functionally equivalent to a stroller, and we keep our child in it at check-in to demonstrate that point as easily as possible. So I know that this works - we've done this on 4-5 trips. But we're flying on Spirit Airlines for the first time in the near future, and I remain a bit concerned that they might not accept our argument that it's equivalent to a stroller (and thus should be eligible for gate-check with no charge). Has anybody ever tried to gate-check a child carrier / baby backpack (on an airline that allows stroller gate-checks without charge) and not been allowed to do so? This is also "functionally equivalent to a stroller". So I am not sure about the solidity of your argument on why this should be allowed for free onboard. Some do, but not all. You seem to have found one that does (Frontier Airlines) even if the staff there might give you a somewhat confused look when we explain that the carrier is functionally equivalent to a stroller. Given there are over 5,000 airlines to choose from there is bound to be one at least that does not. For example I suspect People's Viennaline does not. Not the answer you're looking for? Browse other questions tagged air-travel usa luggage family or ask your own question. Are backpacks allowed on Eurolines buses?